The new Bond SATs Skills series is designed to help teachers and parents prepare children for the Key Stage 2 SATs. Flexible and cost-effective, Bond SATs Skills workbooks are ideal for use in the classroom, as homework materials, or as support materials for parents to use at home. Find out more about Bond SATs Skills for your class, visit the Oxford Primary website. 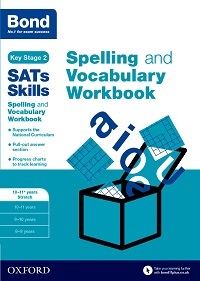 Comprehensive coverage of the National Curriculum – separate workbooks for spelling and vocabulary, grammar and punctuation, arithmetic and times tables. Structured learning programme – the series covers ages 8-11 so that you can start developing your child’s skills gradually in preparation for KS2 SATs. Advice and support for parents – throughout the books, hints and tips will help you effectively support your child's learning at home. Find out more about Bond SATs Skills, visit our shop. These flashcards develop core times table, square and cube number knowledge for National Curriculum Key Stage 2 SATs, 11+ and Common Entrance tests. With renewed focus on times tables and the introduction of square and cube number knowledge in Key Stage 2, these flashcards aid rapid recall and build secure knowledge of number relationships. These flashcards are designed to develop core vocabulary knowledge for Key Stage 2 SATs, the 11+ and Common Entrance. Simple to use, these cards are ideal for quick bursts of vocabulary practice for parents seeking to develop their child’s language skills.